We care about young people at Starr Church! We don’t have a ton of kids yet, but we like to say that what we lack in quantity we make up for in quality: that is, our children and youth receive a lot of one-on-one care, attention, and faith formation. Our children and youth love to come to church. The baptism of a child or infant is intended to signify God’s love of the child, and express the parent or parents’ commitment that the child will have a Christian upbringing. According to Presbyterian faith and tradition, the church community also promises to raise and support the child being baptized to know God and love others. At Starr, we present children with a special gift at their baptism. It is a great celebration for the whole church. Contact Pastor Marianne at m.grano@yahoo.com if you’d like to learn more about baptism for your child. We do have a nursery with paid, background-checked nursery staff, but you’re also welcome to bring your kids with you to worship. We have a lovely church nursery with tons of toys for the little ones, and a stock of diapers ready to go. We ask parents to leave a cell phone number and put their phones on vibrate if we need to contact you during worship. We love when kids disrupt our worship with their energy—we’re glad to have them there. Worship bags are available with Bible coloring books and toys for kids. Partway through the service, we have a children’s message, interpreting Scripture in a way kids can understand, which we try to make memorable for all our children (and incidentally for the adults!). After the children’s message, most children go to our Sunday School. Our Sunday School is led by a team of background-checked volunteers led by elder Linda Finn (office@starrchurch.org, attn: Linda Finn). Linda has a true heart for children and a deep knowledge of Scripture; teaching Sunday School is a calling in her life. We have a one room Sunday school and seek to meet each child where they are in their Bible knowledge and faith journey. We use the Growing in Grace and Gratitude curriculum, which speaks to a variety of learning styles, using fun games and crafts to teach Scripture, and which also includes materials to help children with disabilities. Most importantly, our Sunday school teachers love children and hope to be a caring presence in the lives of our church’s kids. Youth are a valued part of Starr Church. We seek to involve youth directly in the ministries of the church, from participation in worship to helping with the warming shelter. We also offer periodic youth fellowship activities. We hold confirmation classes for young people who have been baptized and would like to learn about professing their faith in Christ, or for young people who have not been baptized and would like to learn about Christ before receiving the sacrament. We take confirmation seriously and ask young people to present a special project to our church session; we hold a special confirmation service in which the confirmands are invited to preach the Word, sharing what they have learned. We sponsor trips for youth, particularly during the summer months when they’re on break. 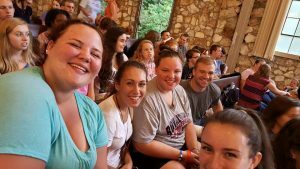 Last year, we took a group of young people to Montreat Conference Center in North Carolina for a youth event with over a thousand teens.